Do you need a flexible SUV for commuting and vacations? 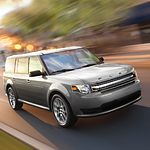 The Ford Flex is a popular three-row midsize SUV. The vehicle can accommodate seven passengers, so it is ideal for carpooling in Ellisville and long family vacations. 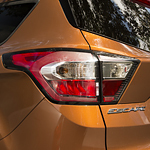 Does the Ford EcoSport Utilize a Roll Protection Program? One of the typical complaints traditional sedan drivers’ level at SUVs like the Ford EcoSport, is the increased possibility of a rollover. While is factual to site that the center of gravity is higher in an SUV than in a sedan, the likelihood of a rollover decreases with the Roll Stability Control system. 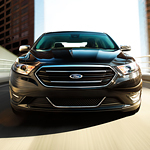 With consistent regularity, owners of the Ford Taurus explain that one of the reasons they're pleased with their choice of automobile is the interior features. Indeed, the Ford Taurus interior features are some of the most highly regarded in the industry today. 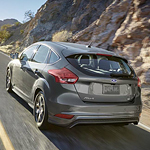 The Ford Focus ST has an EcoBoost engine that is capable of delivering 252 horsepower along with 270 pounds of torque. If you're considering your options for a full-sized passenger wagon that will transport you and your passengers comfortably and reliably, don't look any further than the 2018 Ford Transit Passenger Wagon. With options for 10-, 12-, and 15-passenger models, you'll be able to transport groups of any size. What Kind of Power Can You Expect in the 2019 Ford Fiesta S? Ford offers its Fiesta vehicles in four trims with five configurations. 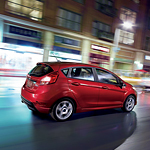 The Fiesta S is the base trim with extensive performance features in the interior and on the exterior. However, the performance feature with the greatest significance is the motor and transmission offered as standard equipment in the Ford Fiesta S trim. 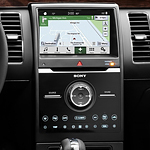 The user-friendly, voice and touch controlled SYNC 3 interface allows you to link the Ford Escape to your smartphone. The SYNC connect can also be partnered with the FordPass app and used to locate your vehicle and use all remote access features, including lock, unlock, start and vehicle status, including fuel level, and requests for roadside assistance. You can also start your Escape by remote control to start your vehicle at a scheduled time. We at Bo Beuckman Quality Ford are excited to announce the debut of Ford's patented Co-Pilot360 suite beginning in the 2019 model year. This comprehensive driver-assist technology system was created to better help drivers handle increasingly congested roads, which is a significant issue here in Ellisville. Are you in search of a mid-size SUV in Ellisville? If so, you should check out the Ford Flex at Bo Beuckman Quality Ford. This is a top choice among consumers at our dealership because it comes with third-row seating and is available in three unique trims that include the SE, SEL, and Limited. One reason our team likes this model is because it is packed with features that provide you with exceptional convenience. Pickup trucks have really increased in popularity in recent years, and the Ford F-150 is no exception. This popular full-size pickup truck offers everything drivers could want in a vehicle: comfort, great performance, power, safety features, many capability features and fuel economy you seldom see in a truck. Come to Bo Beuckman Quality Ford and see this beauty up close. The 2018 Ford F-150 power stroke diesel engine offers a whopping 30mpg and has many features worth raving about. • With a torque of 440 lb/ft and 250 diesel horsepower, it’s best in its class. Ford enthusiasts were pumped to see the announcement from Ford of the upcoming release of the 2019 Ford Fusion. This model is sure to please drivers everywhere thanks to its innovative tech features and proven performance specs. Why is the 2019 Ford Ranger already being considered the midsize pickup truck of the year. It might be due in part to the robotic testing of all those moving parts in this truck. To make sure you have a quiet and enjoyable ride in your new 2019 Ford Ranger, this truck will undergo days of shaking of the frame so squeaks can be found and eliminated. Any noises that could lessen your driving experience are addressed before the truck reaches the assembly line. Have You Seen the Latest Ford Mustang? The 2019 model has been hailed as the best-selling sports coupe. It’s easy to see why. Ford has revamped their moneymaker muscle car over and over again, but this is the first year in awhile that feels like they are doing something completely different. There are more options, incredibly powerful engines, and the legendary Mustang BULLITT, which is guaranteed to make heads turn. The 2019 Mustang is a great example of what a modern-day American sports car should be. It’s fun to drive, sporty inside and out, and high-tech. The Ford C-Max is a well-known compact hybrid that is filled with features that are designed to enhance the driving experience while increasing the gas mileage in a variety of ways. The dual engines work flawlessly together to accelerate, cruise, and use as little gas as possible. To create a smooth ride, the transmission is electronically controlled and will eliminate any hesitation during shifts. It will ensure that the wheels receive the power they need during acceleration. When it comes to offering the top tech features that are helpful for any driver, the Ford Expedition delivers in spades. This popular SUV is earning high marks from drivers everywhere thanks to the cutting-edge tech specs that make driving the Ford Expedition more convenient than ever before. One of the top tech features that drivers rave about the Ford Expedition is the smart driver-assist technology. This includes keeping drivers from colliding into passengers, cross-traffic and other objects while driving or parking. The Ford F-150 might be your next vehicle if you're trying to find a reliable and rugged truck. While it has engine components that can get it through a variety of conditions, its interior is spacious and comfortable, fully equipped with modern touches. The body of the 2018 F-150 is built with aluminum alloy rather than steel, a material that was commonly used in previous years. This aluminum alloy is military-grade and shows incredible strength. At the same time, it's lightweight, which gives the truck greater fuel efficiency and a higher maximum payload. Technology makes our lives more convenient and allows us to get things done quicker and with fewer motions. A popular midsize sedan that incorporates a lot of the latest and most advanced automotive technologies is the Ford Fusion. One of the most advanced features of the Ford Fusion is its ultra-efficient hybrid engine. With a 43 MPG highway rating and a 41 MPG city rating from the EPA, the gas/electric engine has 188 horsepower, an 85 MPH speed in all-electric mode, and a SmartGauge® EcoGuide to help you get the most out of it with good driving habits. The latest model of the Ford EcoSport has plenty of cool and useful style features that you will love. It will make riding around in this new compact crossover even more enjoyable and comfortable. Plus, you will drive around in style. Intelligent four-wheel drive and an efficient 2.0-liter engine are standard in this model. You will also get a sport-tuned suspension handling system and partial leather seats with copper accents. Black exterior accents further round out the look of this vehicle. Whether you're driving through cold environments or making your way through [CITY] in the middle of summer, you're going to need a vehicle that can keep you comfortable. The 2018 Ford C-MAX is a sought-after compact hybrid that has the technology to help you stay cozy in any weather condition. To keep you cool, the C-MAX has dual-zone climate control. You'll have the opportunity to set different temperatures for the driver's seat and passenger side. Controls are conveniently located on the center console so that your passenger can make adjustments when they please. What standard features come on the exterior of the Ford Fusion? The exterior of a vehicle serves to attract the buyer and to show off the personality of the driver. 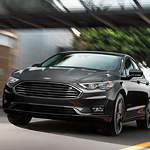 With that in mind, Ford upgraded their base model Fusion (the “S”) with several standard exterior features that attract the eye and help the driver. The exterior of the Ford Fusion S comes with a chrome grille up front and a single exhaust pipe with a bright tip. Between these two features are configurable daytime running lights and LED tail lights. The side mirrors, door knobs, and bumpers are body colored bringing an intense conformity look. The Ford Explorer has been a hallmark of the SUV market since it was released with the first wave of sport utility vehicles in the 1980s. The Explorer remains incredibly popular with both the suburban soccer mom market as well as police departments and other government agencies. Here are two of the most popular features of this well-regarded line of sport utility vehicles. Intelligent 4WD with terrain management is likely to draw attention from the off-road crowd. There are four individual settings available depending on the type of terrain you will be traveling on. Do You Want to Check Out the Ford Expedition in Ellisville, MO? A popular full-size sports utility vehicle, the Ford Expedition features seating for seven as well as an additional 16.9 cubic feet of cargo space. 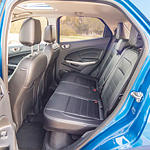 Whether you're going on a family trip or doing a big grocery haul, you and your passengers will have plenty of room. The latest generation of the Ford Super Duty applies millions of miles of testing and design to create this popular heavy-duty pickup. Here are just some of the results of this testing. The 2018 Super Duty is built on the strongest body and frame from previous Super Duty models. It is the only truck in its class that utilizes a high-strength aluminum alloy. What does this mean for you as a driver? It means a lighter, yet more durable truck that is resistant to rust, dent, and dings. Dealerships offer all different types of warranties. Used and new vehicles may come with different warranties as well. Powertrain warranties cover some of the most expensive parts of the engine and transmission. However, they do not cover electronics or drivetrain components. Powertrain warranties typically last longer than most other warranties because they're meant to replace any of the essential components of the vehicle. Bumper-to-bumper coverage is comprehensive coverage that includes electronics, audio, drivetrain, and air conditioning. Before you purchase a vehicle, it is a good idea to have an understanding of what each one has to offer. If you are interested in a muscle car, you may want to know about a few notable design features that are included with the new Mustang. To learn more about the car's design features, read further. The new model comes with LED lights that consume up to 30% less power than traditional lights. The LED lights are available on the turn signals, low and high beams, and optional fog lights. The 2018 model also offers a unique design feature known as the Premium Plus Package. As you are surely aware, you can count on a Ford Taurus to get you where you want to go. At Bo Beuckman Ford, we want you to know that you can also find excitement in this popular full-size sedan. Ford equips the Taurus SE, SEL, and Limited with a SelectShift transmission. This automatic transmission lets you click a button to override its shift points and manually choose your own. In the Taurus SHO, Ford heightens this personalized driving experienced by adding race-inspired shift paddles to the steering wheel. As you’re driving through Ellisville, MO, you’re probably not giving much thought about your engine overheating. However, if you consider all the miles that are driven on a daily basis, the engine has to endure a lot! The temperature in an engine can reach as much as 2,000 degrees and needs to be cooled down. Modern cars require a lot of lubrication on their mechanical components. Many components in a car are made of metal, which means they require heavy-duty oil for optimum lubrication. Lubrication helps reduce overheating and poor car performance when on the road. One of the essential oils that do this job is the differential oil. What Do the Letters on Tires Mean? You may be in the market to get some new tires for your car or truck, and you are wondering what the letters and numbers on the tire signify. The numbers on the tire signify the width and height of the tires and what size wheel they will fit on. The letters have other meanings. In front of the numbers like 215/75r15, you will see a P or an LT. P stands for passenger car while LT stands for a light truck. You will also see a speed rating letter of S, T, or Z. A Z is the highest speed rating. The R in between the numbers for the size indicates a radial tire. Some tires will have a designation of M+S. Are you in the market for a new car? If you want a car that is spacious enough for your family and efficient on gasoline, it may b time to check out the Ford Focus SEL sedan. This car gives you 36 miles per gallon for highway driving and 26 miles per gallon when you're driving in the city. The driver and passenger seats are heated, so you'll be warm and comfortable during the fall and winter months. What Do You Need to Know about Horsepower? Why do you need to know horsepower? It's a unit of power. It's the strength of your vehicle engine. It sometimes separates vehicles in selection. It depends on why you need a particular vehicle. You might need to haul heavy machinery or equipment. You might need to pull a trailer. There are many reasons why horsepower could be important as you pick out your next new or used vehicle. Did you know the term horsepower has been around for ages? It was coined by 18th-century inventor James Watt. Watt was trying to sell more steam engines. He needed a term that helped sell them. 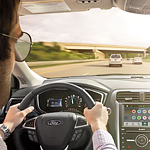 Whether you're planning a long trip or a brief drive to your local grocery store in Ellisville, you want to be equipped with a system that harbors all of your navigation, calling, and media needs with the Ford SYNC 3 Infotainment System. Here at Bo Beuckman Ford, we put our best foot forward in demonstrating the relevance the SYNC 3 has to offer. If you were to put the auto parts from the dealership side by side with parts from those discount automotive warehouses, you would discover in short order how different those parts really are. When it comes to quality, you want to be spending your money for auto parts only at the dealership. The 2017 Ford Fiesta is the most technologically advanced small car in its class with many gadgets rivaling other compact vehicles in the industry today. If you’re in the market for a new car and you have always liked sedans, but do not know which one may be right, there are many questions you could ask yourself. Lucky for you, there are tons of great choices. 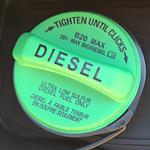 Whether you have a new car or one with some mileage under the hood, you want it to last as long as possible. In order to keep your pride and joy reliably cruising on the highways and byways of Ellisville, you need to stay up to date with your car's vehicle maintenance schedule. It's bad enough to get into an accident that totals your car, but finding out your insurance payout won't cover what you still owe on your loan would be a disaster. If you carry GAP insurance, you won't have to worry about that happening. When shopping for a midsize utility vehicle, many prospective buyers need to know that the model they’ve chosen actually offers the versatility they need. For that, the 2017 Ford Edge checks all the boxes with spacious seating for five, 39.2 cu-ft of cargo volume (73.4 max), and three impressive engines with no shortage of power. But with an emphasis on safety and upscale amenities, you get more than just function. Although the 460 horsepower and 420 lb-ft of torque in the updated 2018 Ford Mustang GT will make it plenty quick, enthusiasts don’t just like raw power. How well a muscle car hugs a corner, blasts through the quarter mile, and transmits road feel are all important factors. Here are a few add ons that make it quicker still, while providing legendary performance on road and track. What Makes the 2017 Ford Explorer One of the Best Big-Bodied Crossovers Around? Are you seeking a full-size SUV for you and yours? Well, if so, we here at Bo Beuckman Ford would be quick to point you in the direction of ours, the 2017 Explorer. And why would we do so? A great pick for the performance enthusiast, the Explorer's range-topping engine -- a turbocharged 3.5-liter V6 -- is, simply put, exquisite. Summer seems to fly by faster each year, which is why making the most of it should be your priority. The 2017 Ford Escape is a fantastic way to do just that, as it provides a comfortable and safe means of travel all season long. According to the critics at J.D. Power, one of the best ways to measure customer satisfaction in the auto industry is to observe the number of problems owners report in the first 90 days of their vehicle purchase. The Initial Quality Study the company conducts is largely comprised of this method. Simply put, its results determine which automaker produces quality models. The impressive 2018 Ford Mustang is arriving in dealerships soon, and the updates have made it a more valuable pony car than ever before. In addition to cosmetic, aerodynamic, and tech upgrades, the new Mustang will also make line-lock—a feature only found on GT models—standard across all versions. Might you be in the market for a midsize sedan? Well, if so, we here at Bo Beuckman Ford think you'll find a whole heck of a lot to enjoy about ours, the 2017 Fusion. "Such as what?" you ask. An absolute beaut of a base trim, the Fusion S is every bit as stylish as it is substantive. More often than not, a midsize sedan with a “sport” badge is nothing more than retuned suspension and a modest uptick in horsepower. After all, the midsize sedan segment is always about playing it safe. But the Ford Fusion bucked that trend when it was launched in its stand-out form in 2012, and its Sport model isn’t just marketing—it’s the most powerful mainstream midsize sedan money can buy. Everyone and their automotive mother wants to knock the Ford F-150 off its perch as America’s bestselling pickup, but none have come close. Constant innovation, including the addition of a class-leading combo of a new twin-turbo V6 and ten speed transmission for 2017 is partially responsible for this. The fact that it can be tailored to your needs and tastes is another thing that makes the F-150 popular. Keep your tires inflated. When your tires don't have enough air in them, it makes your car work harder to move down the road, which means you burn more fuel. Your tires are arguably the single most important aspect of your car, as they are the only thing between you and the asphalt. Proper maintenance of your tires, is often times ignored, causing premature replacement. Additionally, if not taken care of correctly, your tires could fail you at the worst possible moment.